Mmmmmm!! I am becoming a huge fan of ScentSationals melts. Their site is super easy to order from and bonus… many of their scents can be found at Walmart stores across the country. This scent smells SOOOOOOOOOO delicious!! I bought a few of these not knowing what they smelled like and now I wish I would have bought more. To my knowledge, this scent is only available through ScentSational’s website, not Walmart stores but if you happen to see this in Walmart and you love vanilla scents, go smell it and BUY BUY BUY!! Smelling this for the first… both descriptions are equally accurate. This scent is 100% oats and butter with creamy vanilla. LOVED!!!! Mmmmm!! Vanilla lovers… this is a super unique vanilla. The notes that stood out the most to me… the nutty oats with brown sugar swirled into the creamiest vanilla. It was mouthwatering. Scent strength – on a scale of 1 to 10, this was maybe an 8. I melted an entire clamshell pack (3 cubes in two melters) on opposite sides of a huge great-room and boy did this give a nice and steady medium throw. Such a warm vanilla scent that lasted for a full day. I’m a broken record here… LOVED this fragrance!! 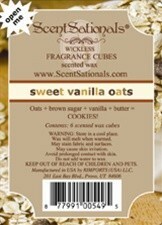 Have you tried Sweet Vanilla Oats from ScentSationals? Review it with us. In the comment section below, review and star rate your experience… it’s easy! Scent description: Oats + brown sugar + vanilla + butter = Cookies.